The Hindu festival of Chaitra Navratri also known as Vasant Navratri is soon approaching. Starting April 6, the nine-day festival worshipping Maa Durga will begin. Each form of Goddess Durga is worshipped for 9 days and each day is celebrated with much fanfare. 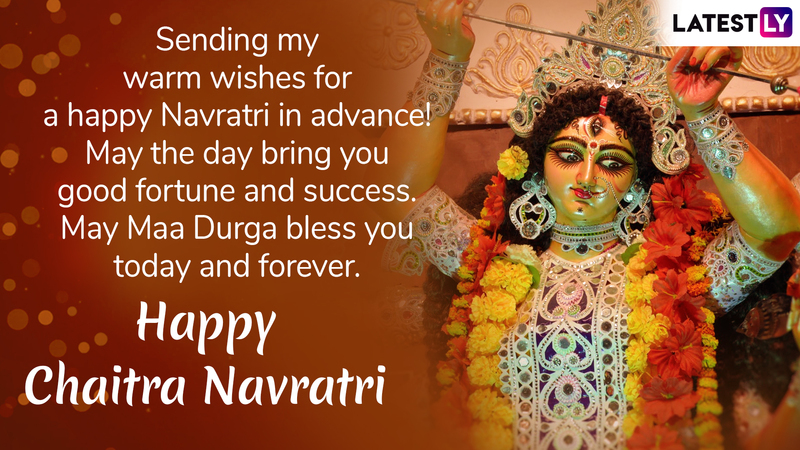 People also exchange Chaitra Navratri greetings and wishes with their friends and family members. Chaitra Navaratri begins on the same day as the beginning of the Hindu lunar calendar month of Chaitra. While the first day of Chaitra Navratri 2019 is on April 6, you can start sending out Happy Chaitra Navratri greetings to your friends, share Navratri images on Facebook, and even WhatsApp stickers to send across your good wishes. 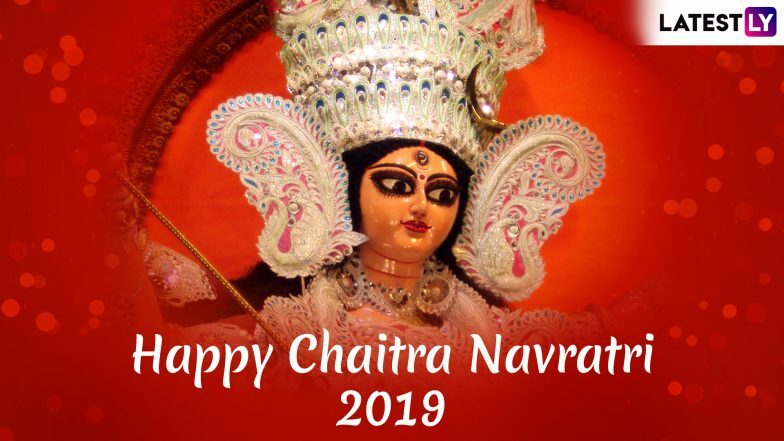 We give you a lovely collection of Chaitra Navratri 2019 wishes in advance. Ugadi 2019 Date and Significance: Chaitra Sukladi Celebrations and Customs Associated With the Hindu New Year. There are two Navratri celebrations in the year. Chaitra Navratri falls in the season of spring and the other celebration in the later part of the year is called Sharad Navratri. People keep a fast for all the nine days and honour Goddess Durga and her nine forms called Navadurga. The last day of the Chaitra Navratri festival is marked by Rama Navratri or Ram Navami, which will be celebrated on April 14 this year. Maa Durga Wallpaper Photos, Colours, Mantras & Dates To Worship Navadurga. 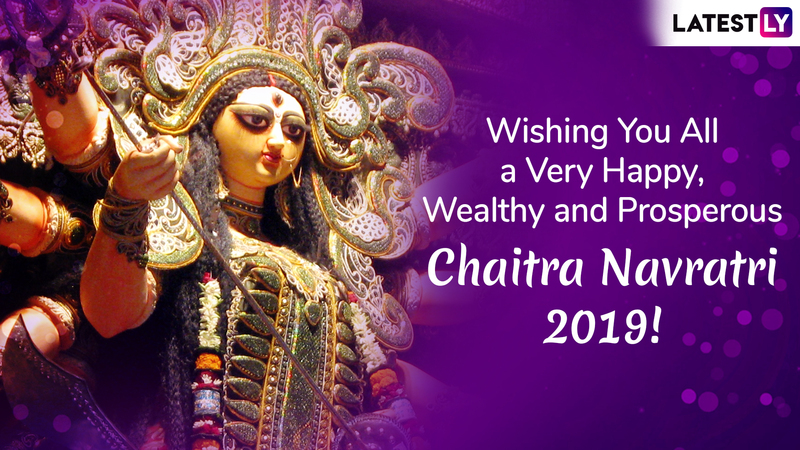 Message reads: Wishing You All a Very Happy, Wealthy and Prosperous Chaitra Navratri 2019! Message reads: May Goddess Shakti be your guiding light and you overcome all your life's challenges with ease. Happy Chaitra Navratri in advance. Message reads: I wish Goddess Durga removes all your troubles and sorrows. Brings nine colors of happiness in your life and all your wishes come true. Happy Chaitra Navratri in advance! Message reads: Sending my warm wishes for a happy Navratri in advance! May the day bring you good fortune and success. May Maa Durga bless you today and forever. WhatsApp stickers are the new in-thing of sending across messages. 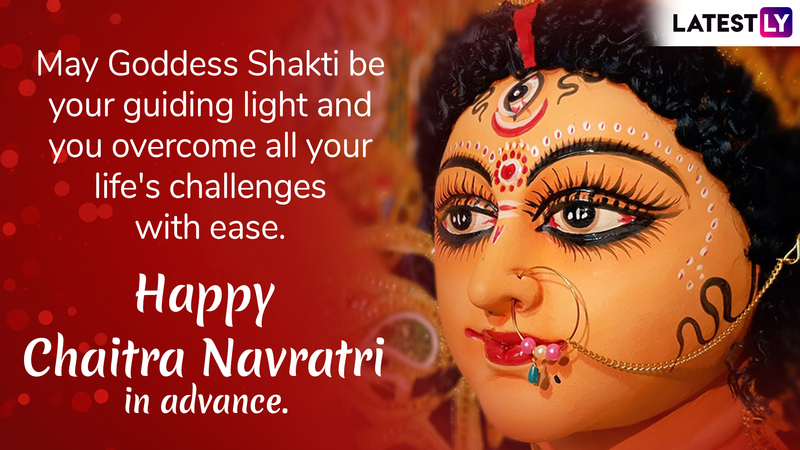 You too can send Navratri WhatsApp stickers to send your colourful greetings of Chaitra Navratri 2019. you can additionally download Navratri stickers from Play Store and send them through the application. 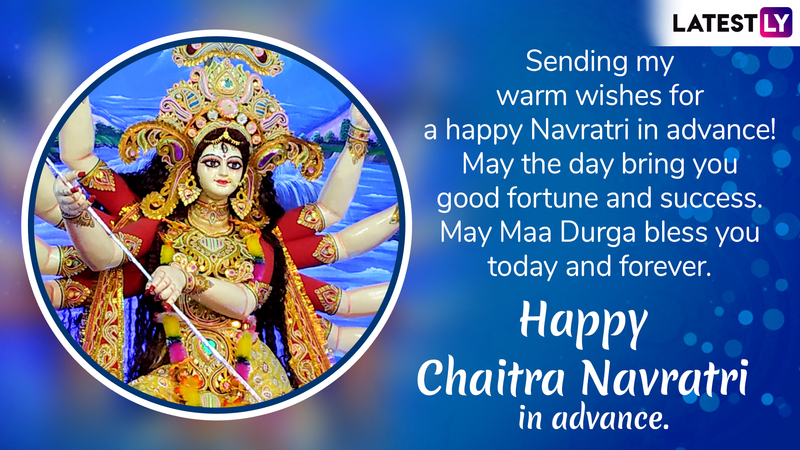 We hope the above collection of Chaitra Navratri messages in advance, help you to send across greetings to your family and dear ones. Wish you all a very Happy Chaitra Navratri 2019!